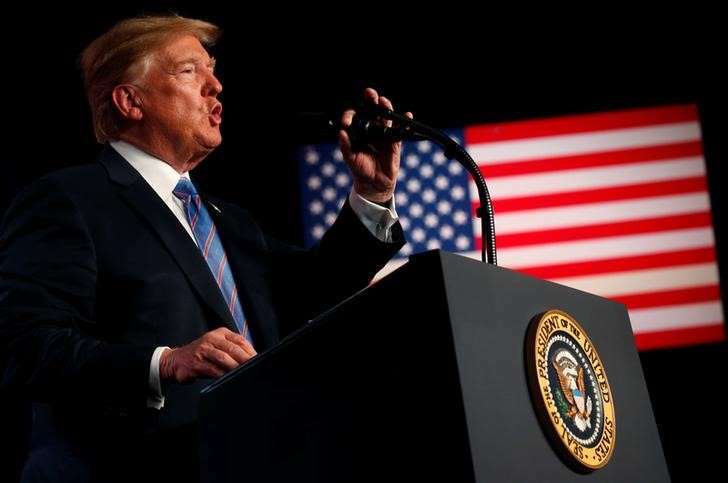 U.S. President Donald Trump delivers remarks at a "Salute to Service" dinner held in honor of the nation's military at The Greenbrier in White Sulphur Springs, West Virginia, U.S. When Donald Trump meets Queen Elizabeth next week, he will become the 12th U.S. President that the monarch has met during her 66 years on the throne, the longest in British history. Apart from Lyndon Johnson, Elizabeth has met every U.S leader since Harry S. Truman but no other U.S. presidential encounter has generated the same level of opposition and controversy in Britain as Trump's trip. [post_ads]Prime Minister Theresa May offered Trump a state visit - a pomp-laden affair usually featuring an open-top carriage trip through central London and a banquet at Buckingham Palace - when she became the first foreign leader to visit him after his inauguration in January 2017. Only two U.S. presidents - Barack Obama and George W. Bush - have previously been invited for full state visits. Trump will get a less lavish one than originally offered, but he will still meet Elizabeth and many British lawmakers have voiced objection to his coming at all. Most recently, the separation of migrant children and parents at the U.S.-Mexico border reignited calls for May to call off Trump's visit.